English midfielder Curtis Edwards struck a 20-yard volley as Swedish minnows Ostersunds drew with Spain's Athletic Bilbao to maintain their unbeaten start in the Europa League. It was an eventful evening in the competition as Bilbao's Basque rivals Real Sociedad romped to a record away win - 6-0 at Macedonian side Vardar - while thick fog temporarily stopped the Group F match between Czech side Zlin and Danish visitors FC Copenhagen. Ostersunds once again took the headlines, though, despite being denied a famous victory against the eight-time La Liga champions by Inaki Williams' 89th-minute equaliser. Former Middlesbrough trainee Edwards, who moved to Sweden after playing for Northern League semi-professional side Thornaby, put Ostersunds within touching distance of a comeback win after Spain striker Aritz Aduriz had given the visitors the lead before half-time. 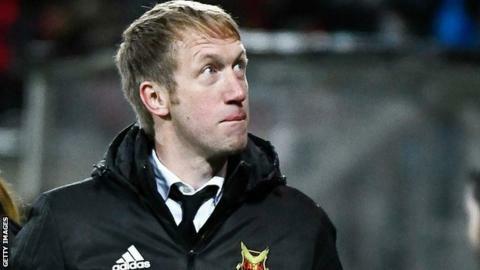 Ostersunds, managed by former Stoke and Birmingham full-back Graham Potter, levelled against the 2012 Europa League finalists through Salisu Abdullahi Gero after the break. Edwards, 23, volleyed in shortly after as they looked set to preserve a 100% record at the halfway stage of Europe's secondary club competition. But Williams tucked in Aduriz's square pass as Athletic avoided a sixth defeat in their past seven Europa League away games. Despite being unable to clinch victory, the point puts Potter's side in a promising position to qualify for the knockout stage on their European debut. Ostersunds were in the Swedish fourth tier when Potter took over in 2011 and have been promoted three times before winning the Swedish Cup and qualifying for Europe for the first time. Athletic, who finished seventh in La Liga last season, are five points adrift of the group leaders after two draws and a defeat in their opening three games. Brazilian forward Willian Jose scored four times in the space of 25 minutes as Real Sociedad thrashed Vardar. It was the biggest away win in Europa League history as Sociedad became only the fifth team to win by a six-goal margin in the competition. Sociedad are second in Group L, three points behind Russian side Zenit St Petersburg, who beat Rosenborg to maintain their 100% start. Seven-time European champions AC Milan were unable to clinch a third straight Group D win after failing to break down Greek side AEK Athens at the San Siro. Milan coach Vincenzo Montella was hoping a victory would ease some of the pressure building on him following Sunday's 3-2 derby defeat by Inter - the Rossoneri's third straight defeat in Serie A.
Ukrainian side Dynamo Kiev and Portugal's Braga also lost their 100% winning records. Dynamo were held 2-2 by Swiss visitors Young Boys, while Braga were beaten 2-0 at home by Ludogorets. Mario Balotelli opened the scoring for Nice when they hosted Lazio in a Group K match between two sides with 100% records. But the Serie A side fought back to win 3-1 through goals from Felipe Caicedo - another former Manchester City striker - and a second-half brace by Serbian Sergej Milinkovic-Savic. Germany's Hoffenheim earned their first European win at the fifth attempt, beating Turkish side Istanbul Basaksehir 3-1. Elsewhere, Steaua Bucharest beat Hapoel Beer Sheva to continue their 100% start and close in on the knockout phase. Thick fog temporarily stopped the Group F match between Czech side Zlin and Danish visitors FC Copenhagen. The game was suspended with just under 20 minutes left because of thick fog in Olomouc with the score at 1-1. Play resumed about 15 minutes later and neither side could find a winner. Match ends, Östersunds FK 2, Athletic Club 2. Second Half ends, Östersunds FK 2, Athletic Club 2. Hand ball by Raul García (Athletic Club). Goal! Östersunds FK 2, Athletic Club 2. Iñaki Williams (Athletic Club) right footed shot from the centre of the box to the top left corner. Assisted by Aritz Aduriz. Substitution, Östersunds FK. Samuel Mensah replaces Brwa Nouri. Foul by Saman Ghoddos (Östersunds FK). Eneko Bóveda (Athletic Club) wins a free kick in the defensive half. Aly Keita (Östersunds FK) wins a free kick in the defensive half. Corner, Athletic Club. Conceded by Tom Pettersson. Attempt saved. Markel Susaeta (Athletic Club) right footed shot from the centre of the box is saved in the bottom left corner. Assisted by Xabier Etxeita with a headed pass. Foul by Sotiris Papagiannopoulos (Östersunds FK). Corner, Östersunds FK. Conceded by Eneko Bóveda. Corner, Östersunds FK. Conceded by Iago Herrerín. Attempt saved. Fouad Bachirou (Östersunds FK) right footed shot from outside the box is saved in the bottom right corner. Assisted by Curtis Edwards. Attempt saved. Saman Ghoddos (Östersunds FK) right footed shot from the centre of the box is saved in the centre of the goal. Assisted by Fouad Bachirou. Attempt missed. Saman Ghoddos (Östersunds FK) left footed shot from outside the box is close, but misses to the left. Assisted by Fouad Bachirou. Substitution, Athletic Club. Beñat Etxebarria replaces Mikel Vesga. Attempt blocked. Mikel Vesga (Athletic Club) left footed shot from outside the box is blocked. Assisted by Aritz Aduriz. Curtis Edwards (Östersunds FK) wins a free kick on the left wing. Foul by Xabier Etxeita (Athletic Club). Tom Pettersson (Östersunds FK) wins a free kick in the attacking half. Alhaji Gero (Östersunds FK) is shown the yellow card for a bad foul. Foul by Alhaji Gero (Östersunds FK). Mikel Vesga (Athletic Club) wins a free kick on the right wing. Offside, Athletic Club. Aymeric Laporte tries a through ball, but Aritz Aduriz is caught offside. Offside, Athletic Club. Xabier Etxeita tries a through ball, but Iñaki Williams is caught offside. Tom Pettersson (Östersunds FK) wins a free kick in the defensive half. Substitution, Athletic Club. Iñaki Williams replaces Iñigo Córdoba. Goal! Östersunds FK 2, Athletic Club 1. Curtis Edwards (Östersunds FK) right footed shot from outside the box to the bottom left corner. Assisted by Saman Ghoddos. Attempt saved. Saman Ghoddos (Östersunds FK) right footed shot from outside the box is saved in the centre of the goal. Assisted by Alhaji Gero. Attempt missed. Raul García (Athletic Club) right footed shot from the centre of the box misses to the left. Attempt saved. Tom Pettersson (Östersunds FK) header from the centre of the box is saved in the top right corner. Assisted by Ronald Mukiibi with a headed pass.